Its a pretty simple project and requires very little wood and makes a great gift. (update) My sister-in-law got it. This one is made with a Walnut base and an Olive-wood finial. It is buffed finished and polished. I grabbed a small block of walnut, and a piece of olive-wood. I also grabbed a 1" center finder, hammer my 3" faceplate and a small block of 2X4 wood. The first thing thing I did was mount the 2X4 to the faceplate with screws. (do not use screws that are too long), you are going to need about a half inch of depth in the 2X4 to part the base off of the lathe when finished. After you get it nice and flat remove the faceplate from the lathe and prepare the base of the ringminder Cut piece of walnut about 5X5X1" and then place the faceplate over the workpiece as centered as you can get it. I used a Center finder punch thing. It is a 1" chunk of steel about 6 inches long with a tiny point coming out in the center of one end. I slid it thru the faceplate and into the walnut and tapped it with a hammer. (this gave me a divot for the live center on the tailstock to follow). Re-mount the faceplate and slide the tail-stock up. Apply glue to the rim you created on the 2X4 and bring the walnut board up with the divot facing the tail-stock. hold the walnut on the centered divot to the live center while cranking the tail-stock out to clamp the walnut to the 2X4. Let it set for a couple hours. Step 3: Rough the Outside and Smooth the Face of the Walnut Base. Rough turn the outside until it is nce and round then move your toolrest to the face of the walnut and using a scraper carefully smooth the face. After the face is smoothed we need to bore a 7/8" hole about half way through the center of the ringminder base. I used my tail-stock chuck to accomplish this. I used a block of Olive wood for the finial. I first removed the base with the face-plate from the lathe and set a-side. I installed my chuck and gripped the small spindle of wood and brought my tail-stock up to secure it. I then rounded it until it was around 1" in diameter. At this point its wise to switch to 80 grit sandpaper to give it a slight taper. Note while you sand keep trying to fit the end of the finial into the hole that we bore on the base. you want to be able to pound it in about 1/2" deep with the use of your fist. That should give you an idea of how snug it should be. Once you have it nice and tight remove the base and bring the tailstock up to secure it while you part the finial the rest of the way off. Remove the chuck and install the faceplate with the base back onto the lathe. rub some yellow glue around the end of the finial that is going into the hole and pound it in with your fist. Before the glue drys, bring the tail-stock up and center the end of the finial as best you can and tighten the tail-stock to hold the finial in place until the glue sets. The shape of the base and the finial is completely up to the maker. Just go slow, take your time. Finials are tricky and one litlte snag can turn the piece into firewood. Its also a good idea to sharpen before you do the finial.. This thing is small, so sanding goes a long way here. Rough and finish cut the base to your liking. Sand the whole thing from 80 grit, all the way up to 600 grit. Be careful around your finial edges, you can quickly eat the sharp edges away with a slight touch of sandpaper. Clean up your work area and prepare to buff it. I learned a technique for buffing pens and pencils that works well. I use the three stage system, without the wheels. I scrape off dust from each stone onto a cotton cloth. ****GLOVES, RAGS, LONG HAIR, LONG SLEEVES, TIES ETC. DO NOT BELONG NEAR A LATHE**** so use some common sense and caution with the cotton rag. the cloth is folded into about 1"X1" square about 3 4 layers thick. scrape the bars of buffing compound with a knife directly onto the rag, then carefully bring the rag to the workpiece while it is spinning and buff away. Go thru each of the three stages slowly and carefully. I added a little burn mark around the sharp points of the finial by wrapping a cloth around a small block of wood and hold it to the edges while the lathe is spinning at high RPMs. It only takes about 5 seconds and I think it added a nice little touch. Now it is time to part the piece off of the 2X4 block. Go slow, and part it off all the way. 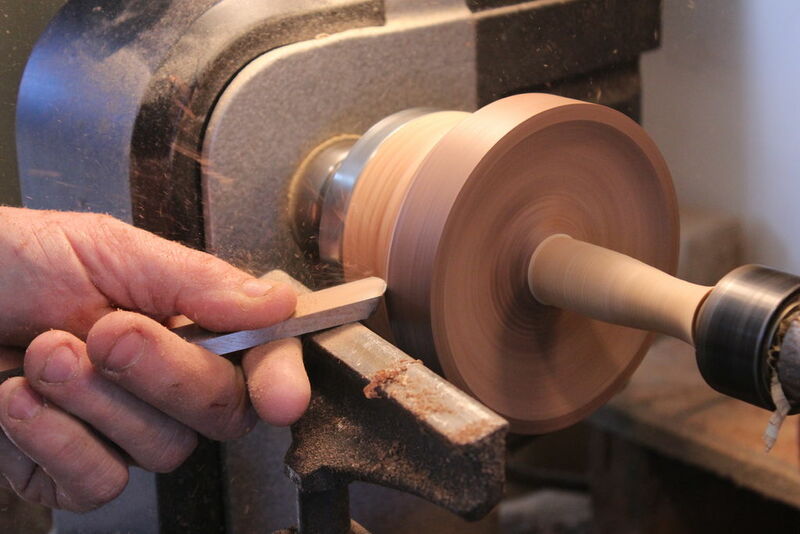 run the lathe at a slow speed so that when it does come off it isn't spinning too fast. after it is parted off, Use a finish sander with 80 thru 320 grit to finish the bottom off. After all that I used my home made food safe finish. This finish is an excellent moisture barrier. Once its wiped dry The ring minder is finished. Use it around the sink, on a night stand or wherever you take your ring off. Just got a wood lathe, think this will be my first project! (in the tune of in the end by linkin park) it seems so hard and yet so nice but in the end they aint gonna realize! This looks great! I have yet to try my hand at turning, but I'd love to try this out. Nice job! The sooner the better, right? Oooh, that looks nice :D I like the picture of the holder with the ring on it! Oh, they all look great :) I particularly like that one since it has the green and brown blurred background with the nice crisp image of the ring holder in front and the ring (which is beautiful) helps show off what it is (even though it is obvious what it is)!